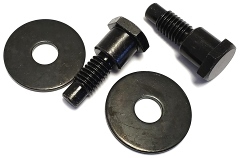 Each kit includes two black zinc plated hardened shoulder bolts and two black zinc plated flat washers. This kit is reproduced to the 1970 and later specifications, but can be used on earlier applications. The flat washer is placed between the bucket seat back hinge and the lower seat cushion. One kit required per A, B, or E-Body bucket seat. An excellent reproduction seat back release lever kit for 1968-69 A & B-Body bucket and 1970 A & B-Body bench seat backs. 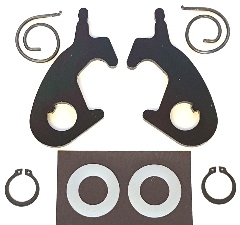 Kit includes the seat back release levers plated in black zinc as original, two nylon washers, two HD snap rings, and correct left & right release lever springs. Complete your new interior with new seat back hardware. One kit required per vehicle. Excellent reproduction of the front door vent wing lower adjustment rod used on 1967-72 A-Body and 1968-70 B-Body applications. Machined to duplicate the features of the original part including the slot on the threaded stud, then zinc plated for corrosion resistance. Includes correct 5/16-18 hex coni sems mounting nut and 1/4” foam anti-rattle strip. Two kits required per vehicle. Reference Chrysler part numbers 2860 010 and 120 376. Some parts not made in USA. Excellent reproductions of the 1970-74 Barracuda/‘Cuda deck lid latch and lock cylinder link levers. The kit includes both levers, two e-ring retaining clips, and two link retaining clips. Levers are formed from correct gauge material, include the correct detent emboss on the link end, and are clear zinc plated like original. 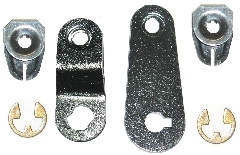 Great for replacing corroded original parts or use to complete your latch assembly. This high quality reproduction deck lid latch release link is accurately formed from correct gauge material with machined grooves at each end like originals. Two NOS zinc plated rod end clips are included to secure the rod to the lock cylinder and deck lid latch. Used on 1970-71 Barracuda and 'Cuda applications. Reference part number 2999 349. This high quality reproduction deck lid latch release link is accurately formed from correct gauge material with machined grooves at each end like originals. Two NOS zinc plated rod end clips are included to secure the rod to the lock cylinder and deck lid latch. Used on 1972-74 Barracuda and 'Cuda applications. Reference part number 3586 371. These door lock link rods are accurately formed from correct gauge stainless steel wire for extra strength and durability. They connect the door lock cylinder levers to the door latch assemblies and are often lost or missing. Used on 1967-72 A-Body 2-door applications. Reference part numbers 2765 778 and 2756 779. One pair required per vehicle. These door lock link rods are accurately formed from correct gauge stainless steel wire for extra strength and durability. They connect the door lock cylinder levers to the door latch assemblies and are often lost or missing. Used on 1968-70 B-Body 2-door applications EXCEPT Dodge Charger. Reference part numbers 2862 210 and 2862 211. One pair required per vehicle. These door lock link rods are accurately formed from correct gauge stainless steel wire for extra strength and durability. They connect the door lock cylinder levers to the door latch assemblies and are often lost or missing. Used on 1970-74 E-Body applications. Reference part numbers 2999 404 and 2999 405. One pair required per vehicle. Injection molded ABS spacers with correct serrated locking washers. Each kit contains four of each. Replace your broken or deteriorated fiber spacers and rusty washers! 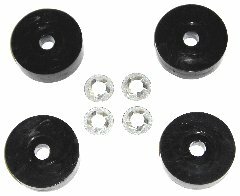 These fit over the mounting studs on the bottom of both bucket and bench seats. One kit required for bench seats, two kits for buckets. Bucket seat latch and spacer sets fit most A/B/E-Body bucket seats. Replace your worn or missing latches today to keep your seats from folding forward. 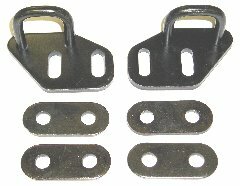 Sold in sets of right and left hand latches with four spacers. Black zinc plated as original.